For the most part located in the Himalaya Mountains Nepal has a very diverse geography with 90 mountain peaks over 7000 meters with eternal snow, as well as a almost tropical climate at Terai at an elevation of only 100 meters. Nepal is predominantly Hindu with a large Buddhist minority. Having been a monarchy for centuries, it was recently changed to a republic. The flag of Nepal is unique as it not shaped as a rectangle but as two triangles on top of each other. In the capital Kathmandu you can visit the Pashupatinath Temple which is the oldest Hindu temple. The Durbar Square is also a must visit, here you can find palace, temples, museums, and old statues. Old ruins can be found in Lumbini, the place where it is said Buddha was born. 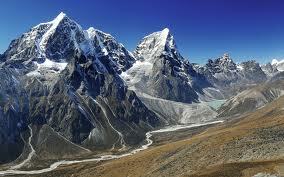 Most people come here for the trekking and climbing in the Himalayas. You can hike on Mount Everest, the highest mountain in the world but there are many other places, more beautiful and less crowded than the Everest. Trekkers mostly head out for the Everest or Annapurna area and go on what's called Tea-House Trekking, as you can do this independently without expensive guides and Sherpas. These tea houses are a day's hike apart and here you can find lodging, hot showers, beer and even pizza. At typical Nepalese dish is Momo. Momo is a kind of dumpling made of vegetables and minced meat, but the national meal is Daal Bhaat Takaari, a spicy feed made of rice and vegetables, which is ubiquitous and can be found everywhere. You can also try Puri Tarkaari, a kind of vegetables curry eaten with fried flour dough. Use Utiket to find the best flights to Nepal. Need place to stay in Nepal? Look for more Cheap Flights to Nepal.